Brazilian percussionist, singer and songwriter Nanny Assis on stage in New York City. Every February in the week preceding Lent, the streets of Salvador in the Brazilian state of Bahia come alive for Carnival. The sound of samba drumming from large, informal street percussion groups — known as blocos — is the pulsing heartbeat pumping a flood of brightly clad revelers through the arterial roads of the old colonial city. The annual festival may be what Salvador is most known for around the world, but it is just one part of an incredibly diverse culture, rich with African, Arabic, European and native Brazilian influences. The city’s cuisine, art and architecture are recognized internationally. But for Salvador-born percussionist, singer, songwriter and Connecticut transplant Nanny Assis, Salvador’s most important export is that propulsive drumming. “In Salvador you have different communities all over the place. You can hear manifestations of all kinds, but essentially the music from Bahia is rooted in African music. The rhythm is so strong, so intense,” Assis said in an interview on a bright Saturday morning recently. Sporting a backwards tweed flat cap and wearing black-framed eyeglasses and a charcoal blazer, he was seated in the rear of a bustling Stamford Starbucks. The coffee shop interlude was a quick stopover for the busy musician, who was to perform in New York City later that day. Assis, a percussionist since the age of 7, was born in Salvador in 1969, the son of a Protestant pastor. His rhythmic education began with his exposure to sacred music in the churches where his father preached. Before long, Assis began to expand his repertoire, playing what he heard in the streets of Salvador and on the radio — notably samba, jazz and rock ’n’ roll — and nimbly straddling genre lines. As a teenager he was simultaneously a member of a rock ’n’ roll band and a regular on the city’s jazz music scene, alternately playing covers of classic rock bands like Rush and listening to John Coltrane and Miles Davis. When Paul Simon released “The Rhythm of the Saints” in 1990 — a samba-reggae revelation whose opening track, “Obvious Child,” featured the Afro-inspired drumming of Olodum, a Bahian bloco — the sounds of Salvador were disseminated throughout the world and new musical opportunities emerged for Assis. At 23, he landed a spot on tour with a Texas band called Rolling Thunder that was looking to recreate the samba-reggae sound on “Rhythm of the Saints.” This prompted Assis’ first trip to the U.S., a nine-month excursion in the course of which he lived primarily on a bus. Glamorous though it was not, the experience cemented a desire in Assis to move to the U.S. for good and pursue a career in music. Four years after first stepping foot in the country, Assis moved to Manhattan. “I came there around 1999 and started playing once a week at a place in the Village. Almost every weekend I’d go to clubs and bars; I’d sit in a lot and collaborate with other people. Little by little I started to make more friends. I met some great musicians, always with the idea not only to learn, but to share,” Assis said. Those connections and collaborations resulted in the recording of Assis’ first album, “Double Rainbow,” in 2007. 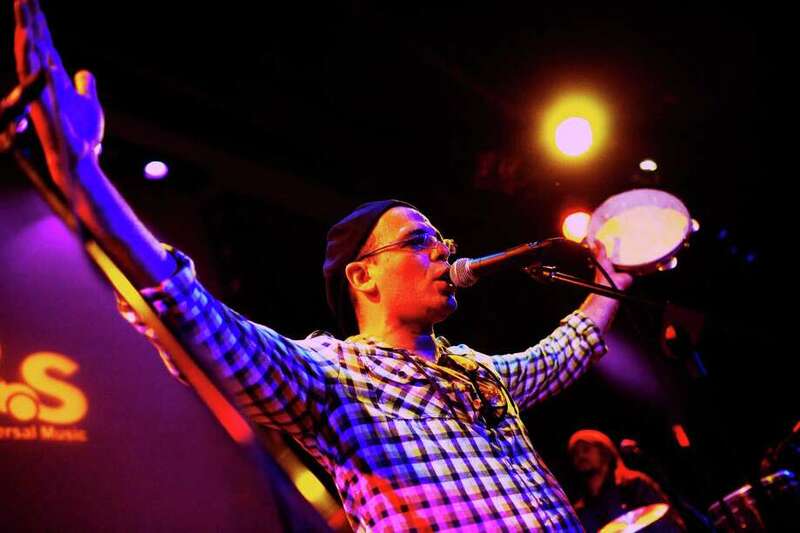 A second album, “Brasilian Vibes,” on which Assis collaborated with fellow percussionist Arthur Lipner, followed in 2010. Shortly thereafter, Assis was given the 2011 Brazilian Press Award for Best Singer of the Year. His latest album, “Honey and Air,” with the Requinte Trio, comprised of Assis, John Di Martino and Janis Siegel, was released at the end of 2015. While Assis established himself as a successful touring musician, he grew tired of the city. “Living on 86th Street wasn’t the best because of the space. I had kids and a family, so I wanted to live the way I live in Brazil, with trees and nature. Leaving New York was necessary,” Assis said. After stints in New Rochelle, N.Y., and Stamford, Assis settled for a time in New Canaan, where he has played local venues, including Chef Luis Restaurant, and has given presentations on the music of Bahia in New Canaan public schools. Now in the midst of promoting “Honey and Air” with tour stops in the U.S., U.K. and Brazil, and working on multiple side projects, Assis spends much of his time traveling, though he suggested his peripatetic lifestyle may not be permanent. “I’ll be back in New Canaan for sure,” he said before leaving Starbucks for his next gig.